Yes, I interviewed with a mom who was on the show 'Wife Swap'. How do I know this? Well she told me, of course. She was very proud of her 'Wife Swap' fame. She gushed to me about it during our first phone interview. She literally introduced herself to me as "Tanya" from 'Wife Swap'. Umm...I don't know who you are or what that means. I later googled her name to make sure she wasn't making this up, and she wasn't. The woman was telling the truth. Being on a show like 'Wife Swap' really isn't that big of a deal. I mean, cool I guess, but there's no fame from it. You don't walk away from that show with an offer for your own reality TV spinoff. And you definitely don't walk away from that show with the ability to introduce yourself to people as "Tanya* from 'Wife Swap'". I'm not at all trying to rain on her parade, but she was flaunting herself as if she was some big deal. Like people knew her because of it. They didn't. So even after all that, I went against my gut, and I decided to interview in person for the job. This was a big deal because I had to drive 4 hours to my college town (I was home for the summer) just to interview. I thankfully scheduled some other interviews during the same trip so I didn't put all my eggs in one basket. Though, my intention was to secure the job with Tanya because even though I got a weird vibe from her -- she was offering good pay and a flexible schedule for my college classes. She had basically told me over the phone that I had gotten the job and that we just needed to meet in person to finalize everything. When the day finally arrived to interview and meet her kids, I was nervous and excited at the same time. I didn't know what to expect from her since I had gotten a weird vibe, but I was also excited to secure my employment for the upcoming school year. I show up to her house on time for our interview, and as I'm walking up to the door, I can hear a lot of noise coming from the backyard. I ring the doorbell. 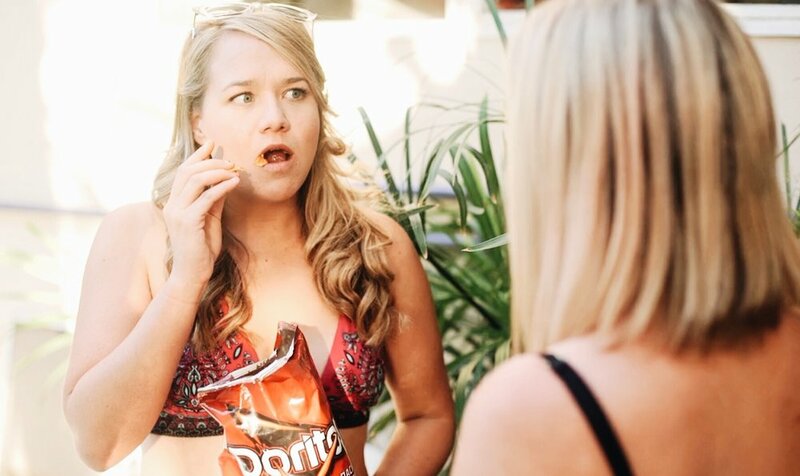 Tanya opens the door and she is standing in front of me dripping wet in her bikini, holding a bag of chips. I can see straight through the windows to the backyard and notice that she is hosting some sort of pool party. She was definitely surprised to see me -- it appeared as though she had forgotten about our interview. I was incredibly confused, but went ahead and told her that I understood if she needed to reschedule and that I could come back the next day before I started my drive back home. She said it wasn't necessary, she hadn't forgotten, and that she planned to meet with me despite having a house full of guests. Right. As we proceeded with the "interview", I just became more and more uncomfortable. The mom was running around the house like she was on something and she kept making jokes about if I minded that she was in her bikini. I briefly met her kids, but they were busy swimming in the pool with all the other party guests. I met a bunch of the random people at her house and she introduced me to them as her "new nanny". I just wanted the whole thing to be over. I wanted to get in my car and leave. I get that a nanny job is unlike any other in that it's very personal -- but that doesn't mean you interview a potential nanny while wearing your bathing suit! There is professionalism that is still expected. Even though I was a new nanny, I knew that this interview was totally unprofessional and it made me very uncomfortable. Because, it wasn't just her being soaking wet in her bikini -- it was her spastic movements and inappropriate affect. I'm not sure if she was on drugs or had something deeper going on, but either way, I wanted nothing to do with it. She seemed very unstable and it did not seem like a safe working environment for me. *Names have been changed in this story for anonymity reasons.